If you suffer from severe or frequent acid reflux, also known as gastroesophageal reflux disease (GERD), you may be inspired to modify your diet. The traditional American breakfast includes several items that could trigger symptoms. However, everyone's tolerance of foods is different. Rather than automatically ruling out any particular items, the American College of Gastroenterology's 2013 clinical practice guidelines recommend an individual approach -- that you determine for yourself what foods aggravate your symptoms. Certain choices, however, are more likely to trigger acid reflux, and if you find traditional breakfast items are causing you trouble, you still have many healthful alternatives. If you like coffee or tea in the morning, you may be fortunate enough to tolerate these without acid reflux symptoms. However, these beverages may potentially worsen symptoms by relaxing the band of muscles called the lower esophageal sphincter, or LES, that serves as a barrier valve between the esophagus and the stomach. When the LES relaxes, acidic digestive juices leak into the esophagus, causing inflammation and irritation. Other potential triggers to acid reflux symptoms include mint tea, hot chocolate, other caffeinated beverages and drinks containing alcohol. Herbal teas may be a non-irritating alternative. For example, chamomile's anti-inflammatory benefits may help the pain and irritation from GERD. Milk is usually well tolerated, although low-fat or nonfat milk may be better options than whole milk. Alkaline foods -- including plant-based milks such as almond and soy -- may also reduce stomach acidity, although more research is needed to determine the effectiveness of this approach. Fruits and juices are common breakfast choices and, if tolerated, healthy additions to the morning meal. However, certain fruits and juices are considered acidic -- such as citrus fruits and tomato juice -- and consuming these might trigger acid reflux symptoms by irritating an already inflamed esophagus. The acid in these foods can also activate pepsin, the enzyme found in gastric fluids, which is responsible for protein breakdown. Any pepsin activated in the esophagus could damage its lining. Therefore, it's a good idea to avoid fruits or juices that aggravate your symptoms. Apples, bananas, avocados, watermelon, cantaloupe and pears are examples of lower acid fruits that may work better. Breads and cereals are staples in most breakfast meals. As a rule, these foods are well tolerated and do not aggravate acid reflux symptoms. However, high fat choices such as croissants, doughnuts, sweet rolls and muffins may slow stomach emptying -- and the contents of a full stomach are more likely to reflux into the esophagus. 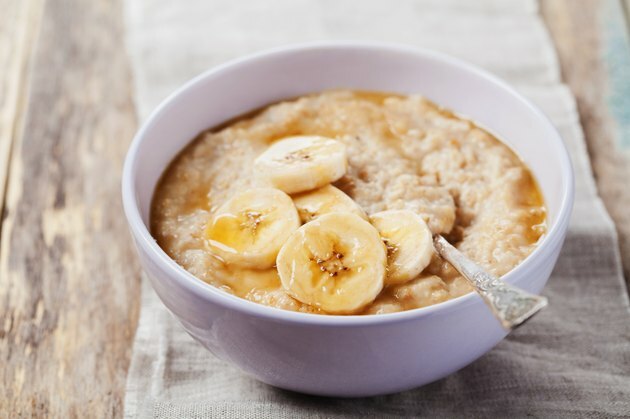 High fiber breakfast choices, such as whole grain bread, whole wheat English muffins, bran cereal or oatmeal are better options -- they are naturally low in fat, and the fiber helps move food more quickly though the digestive system. If you increase your fiber intake quickly, you can temporarily suffer more gas and bloating, so it's best to gradually incorporate more fiber into your diet. Protein foods such as eggs, cottage cheese, peanut butter and breakfast meats are common breakfast choices. High fat meat products such as bacon or sausage may slow down stomach emptying, and this can worsen acid reflux by relaxing the LES and increasing acid production in the stomach. Eggs are generally well tolerated, but are best prepared boiled, poached or cooked in a nonstick pan with little or no oil. Leaner meat options include Canadian bacon, ham, and turkey or chicken sausage. Also consider plant-based alternatives such as peanut or almond butter, scrambled soft tofu, soy bacon strips and soy sausage links. Acid reflux and GERD are managed by a combination of medication therapy and lifestlye changes. While no foods are universally restricted for acid reflux sufferers, certain diet strategies may help ease symptoms. Losing excess weight is an effective way to control and even prevent acid reflux symptoms, so a leaner, healthier breakfast is a good place to start. If any foods or beverages make your acid reflux worse, consider limiting or avoiding them. You can also minimize your symptoms by not lying down two to three hours after eating. Finally, be sure to eat breakfast, because skipping meals may prompt you to overeat later -- and a full stomach can aggravate symptoms. If not managed well, acid reflux and GERD can lead to serious complications, including a risk of esophageal cancer. Tell your doctor if acid reflux is seriously impacting your quality of life, especially if you are experiencing chest pain, chronic cough or wheezing.